Was The US-led attack On Research Centres A Smokescreen To Incapacitate Syrian Air Force? No chemical leaks were observed even after the airstrikes on “chemical weapon facilities”, revealing the absurdity of the US claim. The United States said it launched, along with British and French forces, 76 missiles — including 57 Tomahawks with 450 kg payload capacity — at three buildings housing Syria’s Barzah Scientific Research Facility. Along with the Tomahawk cruise missiles, 19 joint air-to-surface standoff missiles (JASSM) with 453 kg payload capacity were deployed against the facility. Why would one pound three abandoned buildings with 33,000 kg of explosives? Also, the the level of destruction at Barzah site does not conform to the impact such large number of explosions would have caused. Military experts have raised serious doubts over the US’s claim of targeting the “chemical weapon facility”, and pointed out that the real objective was probably to cripple the Syrian Air Force offensive capabilities. It seems the western military coalition presented half-baked information to the public, and apart from Barzah facility near Damasus and Him Shinshar facilities, numerous Syrian military air bases were targeted. Reports suggest that 12 missiles were launched at the Al-Dumayr military airbase, 18 missiles at the Baly Military airbase, 12 missiles at the Shayrat airbase, 9 missiles at the Mezzeh Military airbase, and 16 missiles were launched at the Homs Military airbase. These missile numbers add up to the reveal the main objective of the US-led coalition for launching a volly of 105 missiles into Syria on April 14. The Syrian air capabilities backed with Russian support have provided the Assad government an upper hand in its fight against US-UK-France backed forces attempting to overthrow the government. And this is not the first time that United States attempted to target the Syrian air force “in response” to the alleged chemical attacks. In April 2017, under the presidentship of Donald Trump, the US launched 59 Tomahawk cruise missiles against the Shayrat military airbase. A similar strategy was used during the invasion against Iraq in 1990 and 2003. During the first Iraq invasion, the US annihilated the Iraqi air force, one of the largest in West Asia. This altered the dynamics on the ground by choking the Iraqi ground of crucial air support. In the United Nations, the US and allies, in order to ground Syrian Air Force had attempted nearly five times to pass a ‘no-fly zone’ resolution, similar to the one imposed in Libya. In 2012, after the UN Security Council (UNSC) mandated the no-fly zone over Libya, the North Atlantic Treaty Organisation (NATO) forces manipulated it to topple the Gaddafi regime. Though the US and its allies have refuted the claims that its missiles were intercepted by the Syrian air defence system, reports suggest that a number of missiles may have have been shot down. 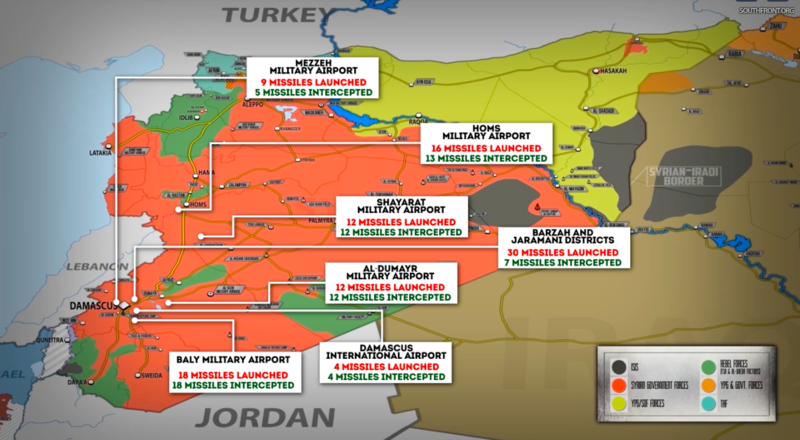 The reports further suggest that most of the missile strikes against the military air bases have been intercepted by Syria’s Buk self-propelled missile system, the S-125 air defense system, and the S-200. 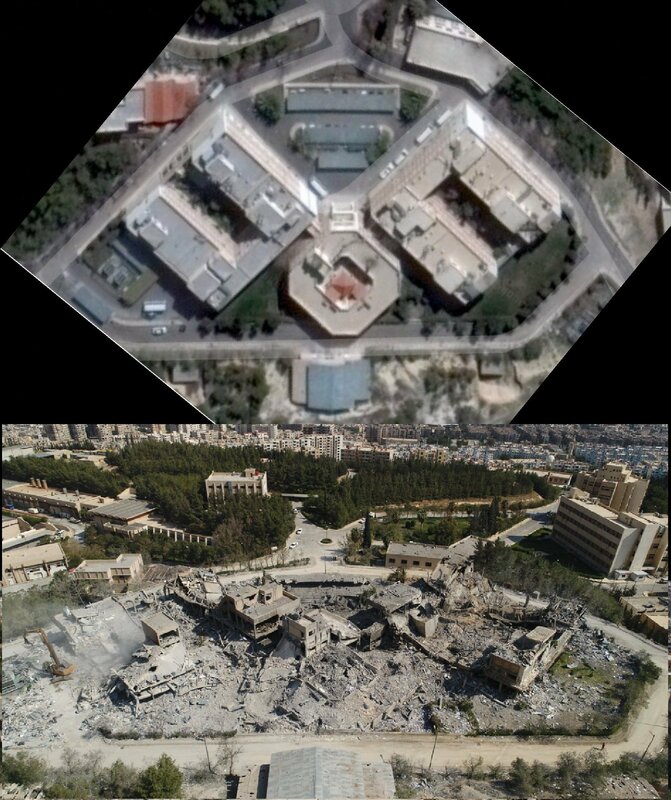 Ad for the claim made by the US, Britain and France that Barzah Scientific Research Facility was used to “produce deadly chemical weapons — chlorine or sarin gas”, there were no reported chemical leaks from the centre — even after it was razed to the ground. This raises serious questions regarding the Western claim that Barzah was a chemical weapon site. “If there were chemical weapons, we would not be able to stand here. I’ve been here since 5:30 am in full health — I’m not coughing,” said Said Said, an engineer at the facility, who was working at the centre’s paint and plastics department. It must be noted that the US-led attack happened the very same day that an OPCW team was being deployed in Syria to investigate the alleged chemical attack incident in Douma. It is suspected that the alleged chemical attack incidents in Douma and East Ghouta were used as a false flag by the controversial organisations White Helmets and Syrian American Medical Society (SAMS). White Helmets, an organisation founded by a ex-British army officer James Le Mesurier, along with SAMS has been the information source for all the alleged chemical attacks in Syria. Mesurier is associated with private military companies that are linked to US and Israeli intelligence, while White Helmets’ Rahel Salah is associated with the Syrian armed opposition forces that aims at toppling the Syrian government. Meanwhile, SAMS is a USAID funded lobbying powerhouse, that according Max Blumenthal, an author and journalist, “functions with a single-minded determination to stimulate a US-led war of regime change that will place Syrian Islamists in power in Damascus”. During the East Ghouta operation this year by the Syrian Army, the government forces had claimed that it had found a rebel-controlled chemical weapon facility.